Its been some time since our last news update. First off, we're really proud to announce our Theatre Fantastique episode MADAME LA SOEUR has been nominated for Best Short Film in the 2015 Rondo Hatton Classic Horror Awards. 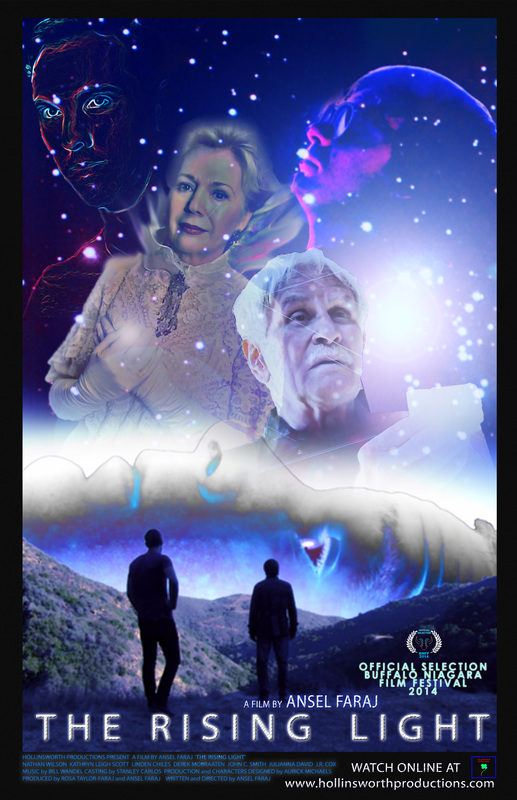 Please be sure to vote -- email the Rondo Awards at taraco@aol.com and in the subject of the email write "Best Short Film - THEATRE FANTASTIQUE: MADAME LASOEUR" -- and that's it! In other 'Fantastique' news, our comedy short THE HAPPY HOME OF THE MURDEROUS MAHONES has been selected to screen as part of the Official Selection of the 2015 Buffalo Niagara Film Festival, on Friday April 10 at 9:30pm on Screen 2 at the Tonawanda Castle in Buffalo, NY . 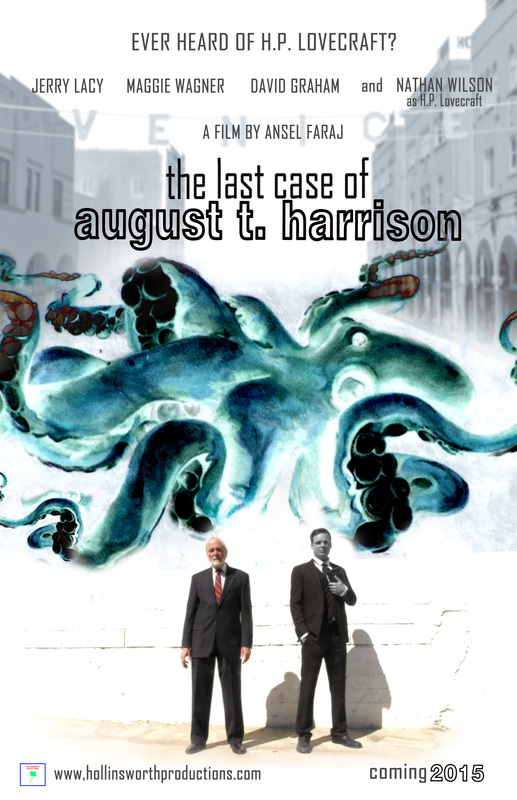 Hollinsworth Productions is excited to announce "The Last Case of August T. Harrison", a dark neo-noir thriller influenced by Val Lewton and H.P. Lovecraft; coming November 2015 to Digital HD, and at possible film festival screenings. 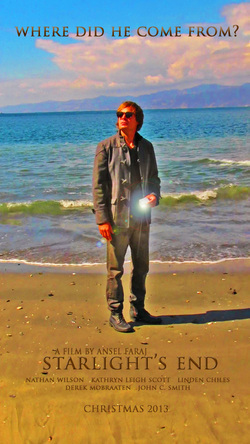 Set in and around Venice Beach, California - August T. Harrison, private eye, comes out of retirement to solve what seems at first to be a bizarre missing persons case, but as he digs deeper, he finds him...self caught in the middle of a dark conspiracy involving the writings of H.P. Lovecraft. Are Lovecraft's tales just fiction? Or do they hold the secrets of the cosmos? Currently in production, the film stars Jerry Lacy (Dark Shadows, Play it Again Sam) as August T. Harrison, Maggie Wagner, David Graham, Lisa Blake Richards, Eric Gorlow, Max Landwirth, and Nathan Wilson as H.P. Lovecraft himself. The film is written and directed by Ansel Faraj, director of 2013's Doctor Mabuse (2013)" and the 2014 web series "Hollinsworth Productions 'Theatre Fantastique'". Ansel Faraj, Nathan Wilson, Rosa Taylor-Faraj and Roxie Zelden are the film's producers. The score is composed by award winning composer Bill Wandel. Also online are past episodes THE MADNESS OF RODERICK USHER; NOSFERATU BEYOND DEATH; and A DESCENT INTO A MAELSTROM. Two episodes are left for Season One -- the spooky MADAME LASOUER (October 2014), and Christmas comedy THE FAMILY WOLFF (December 2014); and we're in pre-production on Season Two, which will begin April 2015. H.P. Lovecraft is coming.... so stay tuned! The DOCTOR MABUSE films are now available to rent via Vimeo On Demand! Doctor Mabuse (2013) from Hollinsworth Productions on Vimeo. DOCTOR MABUSE: ETIOPOMAR (2014) from Hollinsworth Productions on Vimeo. Artgaze Magazine recently reviewed the films, click here to read their verdict. DOCTOR MABUSE - BEHIND THE SCENES FEATURETTE from Hollinsworth Productions on Vimeo. Ansel Faraj, Nathan Wilson, and Derek Mobraaten were guests on Moe Banshee's The Lair Radio Show, where they discussed their upcoming film The Rising Light, and teased upcoming projects Doctor Mabuse: Etiopomar and Todd Tarantula. Hear it below! The Black Gate has a very interesting and informative article about the history behind the character of Mabuse, and a look at our upcoming film. Take a look by following the link below..